You will be received by our friendly staff in the heart of the city and enjoy sunshine days. It’s going to be a vacation experience you´ll treasure forever. Let yourself and family enjoy the best location with an unequalled all-inclusive resort experience. 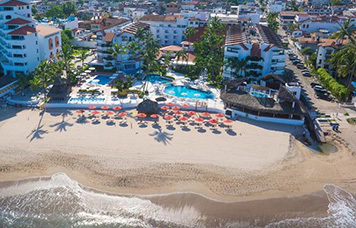 Your dream vacation becomes a reality when you choose a Puerto Vallarta beachfront resort. Nestled between the Sierra Madre Mountains and Banderas Bay, all of the alluring pleasures of Mexico are at your fingertips. With his wonderfuls sunsets, the beauty of the bay framed by mountains and the sea breeze, Puerto Vallarta will become in your favorite vacations place in Mexico. Imagine sparkling outdoor pools or warm sandy beaches. Can you see yourself swimming with dolphins, whale watching or perhaps just a stroll along the Boardwalk? Is your perfect day one spent under a sunny sky on a tranquil beach away from the crowds? Or do you crave a chance to wander charming streets seeking unique shops? 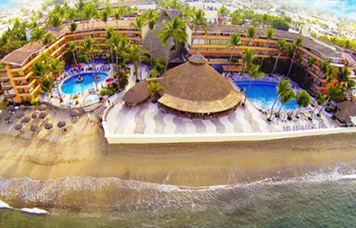 Puerto Vallarta offers all that, and much, much more.